PLEASE NOTE: RATES are PER BEDROOM Double Occupancy NOT for ENTIRE PROPERTY. ONE to FIVE Bedrooms are Available for individuals and groups of 2-12 Maximum. Please contact owner before requesting a reservation for accurate infotmation and quotes. 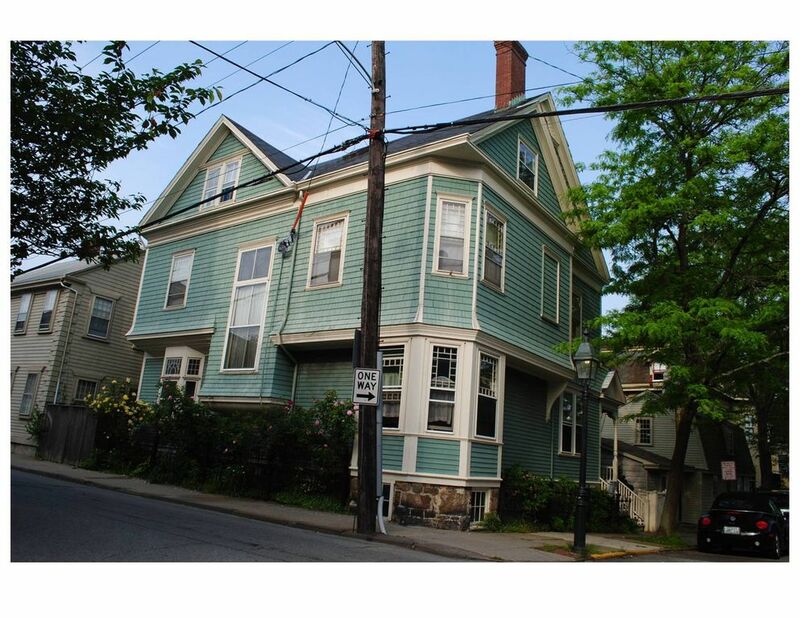 Originally home to sea captain William Austin, the Austin House sits in the heart of Newport's Historic Hill, on the corner of Spring St and Pelham Sts right above the waterfront. The Austin House is one block from Thames St and Bowen's Wharf; steps to Newport Harbor's special events and festival attractions, Newport's best waterfront dining, bars, night clubs, dancing and entertainment venues and world class shopping. The Austin House is a perfect location for wedding and festival groups, family and friend reunions and vacations, group getaways, romantic weekends, corporate retreats and meetings, etc. Harbor activities include boat charters, fishing, sunset cruises and sightseeing. Historic Hill is home to many wonderful cultural institutions. Walk to the Newport Art Museum, the Redwood Library, Bellevue Avenue Mansions, many beautiful antique and craft shops, Historic Churches and Touro Synagogue, the oldest in North America. Beaches are within a mile from the property and kayaking, surfing, kite surfing and oceanside nature preserve trails are nearby. The famous Cliff Walk which meanders above the Atlantic Ocean and fronts on Newport's most famous mansions is accessible by foot from the property. The Austin House is distinguished from ordinary rental experiences by offering on site concierge services, catering availability and daily housekeeping. We strive to make your stay in Newport as comfortable, enjoyable and productive as possible. We also offer discounted tickets to the Newport Mansions and other popular local attractions and activities. There are two outdoor dining areas under covered porch and in patio area. We rented the entire Inn. We loved the location, we loved the "feel" of the house and the Innkeeper was the best. Every morning great coffee, thoughtful breakfast (Not just bacon and eggs) and spotless rooms. Our group had a tremendous experience at Rob's house during the Newport Jazz Festival. Rob's breakfasts are extraordinary. Highly recommend. When you need a great place for that special occasion in Newport, look no further. Austin House is a spacious, centrally located gem. We reserved parts of Austin House for a day and then the whole house for two days to serve as location central for our son's wedding. The rooms were nice sized and comfortable. Robert was always there when you needed him (e.g., directions, lending us a monitor to show pictures, etc.) and invisible when the parties needed/wanted some private time. Robert cooked 3 great breakfasts, asked us each day for serving times to give us flexibility during all the wedding events. Property was clean and well maintained. Robert has made continuous, upgrades through the years and it shows. We wholeheartedly recommend this property to anyone looking for great lodging and breakfast in a centrally located elegant property in downtown Newport. Only caveat is to use the off street parking Robert has arranged. Newport aggressively tickets cars obviously looking for visitors to pay fines to fill its city coffers. I rented out this b&b for a bachelorette weekend and it was the perfect place to stay. It was clean and new, yet had that historic feel. The location was great and we could walk pretty much everywhere we wanted to go. Robert, the owner, was beyond nice and so helpful. The breakfasts were also delicious. I am very happy with my decision to stay here and would recommend it to anyone visiting Newport. The Austin House is in a perfect location, within walking distance to trendy restaurants and boutiques on Thames, all the hustle and bustle of the waterfront, Easton Beach, and the Cliff Walk. I had a wonderful stay here and Robert could not have been a better host. He offered great tips on things to see and do in the area, and most importantly (for me personally), he was an amazing chef. He whipped up delicious and creative brunches (one example: french toast with beet mole and i think goat cheese) to serve to us out on the patio and also provided us with homemade snacks (which he brought up to our room). Robert and his son were great hosts, the house was beautiful, our room was very thoughtfully decorated, and we had a wonderful stay. Not for Entire Property. One to Five Bedrooms are Available for groups of 2-10 Maximum. Please contact owner for accurate quotes. Originally home to sea captain William Austin, the Austin House sits in the heart of Newport's gas lit Historic Hill District one block from Thames St and the waterfront. You are steps from Newport Harbor's special events and festival attractions, waterfront dining, bars, dancing and entertainment venues as well as extensive shopping opportunities. Harbor activities include boat charters for fishing, seal watching in season, sunset cruises and sightseeing. Historic Hill is home to many wonderful cultural institutions. Walk to the Newport Art Museum, the Redwood Library, Bellevue Avenue Mansions, Historic Churches and Touro Synagogue. Beautifully restored 18th and 19th century properties on the Hill contain many beautiful antique, craft shops and cafes. Beaches are within a mile from the property with kayaking, surfing, kite surfing available and oceanside nature trails nearby. The famous Cliff Walk which meanders above the Atlantic Ocean and fronts on Newport's most famous mansions is accessible by foot from the property. Built in 1882 The Austin House is a stately Queen Anne Victorian thoughtfully restored in 2012 by an area team including regional artists and designers and Newport’s renowned house wrights. Now open to the public as The Austin House Inn, guests will find aesthetically stylish and comfortable rooms which combine late 19th Century ambiance and design with contemporary amenities and flair. Offering rooms for 2 to up to 10 guests at a time, the Austin House is able to offer the utmost in service and comfort; with reservations personally tailored to meet your individual needs; whether for relaxation, business or both. Our knowledgeable, local staff will make your visit to Newport a unique and unforgettable experience. The Austin House Inn features two elegant bedrooms located on the home’s first floor allowing guests’ convenient access. There are two deluxe queen bedrooms on the second floor as well. The Spring Room's stained glass windows charm with glowing color as it’s ten foot high linen drapes are drawn back to greet the morning light. A very comfortable queen bed and luxurious bedding are complemented by Hollywood Regency inspired décor. Designer touches include a six foot high plush linen and silk headboard, a freshly restored and reupholstered vintage Louis the XVI loveseat, antique tasseled chandelier, cast plaster, painted Roman table lamp and artworks from our rotating collection. Contemporary amenities include flat screen HDTV with direct TV connection, wi-fi, air conditioning and a large closet space. The bathroom combines antique slag glass windows with a contemporary glass cabin shower enclosure. Antique subway and hexagonal tiles are juxtaposed by sink vanity and shower hardware fixtures fashioned of titanium by Dornbracht, Germany. The Pelham Room features honey toned, antique quarter sawn oak moldings, sliding eight foot high French pocket doors, a three by six foot transom window and antique oak armoire define the space’s strong lines while providing a warm ambiance. The very comfortable queen bed and luxurious bedding are complemented by a raw silk upholstered headboard. A light filled, architectural bath featuring ten foot ceilings, marble tiled shower room with seating, hand carved granite sink by Stone Forest Artisans and titanium Dornbracht fixtures will invigorate or relax depending on the time of day. The adjoining three hundred square ft living room contains a very comfortable, Vanguard pull out sofa bed with queen sized, air dream mattress, flat screen HDTV with direct TV connection, wi-fi, air conditioning and artworks from our collection. The suite’s highlight; a bright, pentagonal sitting area serves as a great dining nook / work area and the suite room has an adjacent powder room with tub. The air conditioned Pelham Room and Suite Room feature antique Hollywood Regency décor including chandeliers, lighting fixtures, neo-classical credenza and other period pieces and details. Upstairs we have two additional deluxe queen bedrooms for individuals or larger groups/ families. Gourmet and healthful breakfasts and other culinary offerings are custom tailored to your individual preferences and needs; offered to you based on your schedule. The Austin House Inn is a moveable feast with outdoor patio eating / sunning area, large covered porch with tables or in room or suite service. The owner / proprietor originally from NYC has many years in the restaurant and hospitality profession as well as being an artist in residence over twenty years in Newport, RI. Guest has read and agrees to house policy: Smoking is prohibited on premises. 50% deposit is refundable up to one month before arrival less a $50.00 processing fee. PLEASE NOTE:: RATES are PER BEDROOM double occupancy NOT for ENTIRE PROPERTY. Please contact owner for accurate quotes based on number of bedrooms / guests. Weekly Rate based on 6 Adults. Management reserves the right to add cleaning and /or service fees onto reservations as well as damage charges at owner's discretion.